For a rich, moist fruit cake, make it in plenty of time as it improves with keeping. This recipe is best made 2-3 months before Christmas, then fed regularly with brandy every 2-3 weeks. Begin the day before you're going to bake the cake by soaking the dried fruit in brandy and orange juice. Leave overnight to ensure that it is plump and moist when mixed into the cake. Marzipan and ice the cake up to 2 weeks in advance. Keep it in an airtight container, or loosely wrapped in foil, ready to decorate a couple of days before Christmas. Place all the fruit in a large bowl, stir in the orange zest and juice, and the brandy. Cover and leave overnight. When you are ready to make the cake, preheat oven to 150°C, gas mark 2. In a large bowl, beat the butter and sugar together until pale and fluffy. Gradually add the eggs, beating well after each addition (if the mixture begins to curdle, add a little of the flour). Add the soaked fruit, any liquid and the nuts and stir well. Carefully fold in the flour with a wooden spoon. Prepare the tin (see Cook's Tips). Spoon the mixture into the prepared tin, spreading it evenly and making sure there are no air pockets. Level the top carefully as the tin will be very full. Bake for 3½-4 hours or until a skewer inserted into the centre comes out clean. If the cake starts to over brown, cover the top with a piece of baking parchment. Leave to cool completely in the tin. Store in a cool, dry place, wrapped in greaseproof paper and a double thickness of foil. Feed the cake with brandy every 2-3 weeks until you are ready to marzipan and ice it (see Cook's Tips). Warm the jam with 1 tbsp water in a small pan. Press through a sieve into a bowl. Invert the cake onto a board or serving plate. Lightly knead 50g marzipan to soften it slightly, then roll small pieces into thin sausage lengths and use to fill any gaps between the cake and board or plate. Brush the glaze over the top and sides. Roll out the remaining marzipan to a 35cm round. Lift it over the cake and ease to fit around the sides, making it as neat as possible around the base. Trim off the excess with a sharp knife. Using sharp scissors, cut off the blunt end of the wooden skewer to make it 19cm long. Roll out the reserved 50g marzipan to 5mm thickness and cut out 6-8 star shapes using the cutter, dipped in icing sugar to prevent sticking. Transfer to a baking tray lined with baking parchment. Lightly toast the stars under a moderate grill until just beginning to colour. Watch carefully as they brown very quickly. Leave to cool slightly, then re-point the tips of the stars with your fingers if they've lost their shape. Push the pointed end of the skewer into one of the stars. Set aside. Lightly beat the egg whites to break them up. Gradually beat in enough icing sugar to make a thin, glossy paste that very slowly loses its shape when the whisk is lifted from the bowl. Turn the paste onto the cake and spread with a palette knife, easing it gently over the sides so it runs in some areas almost to the base. Press a physalis onto the wooden skewer so it meets the star, then press the skewer down through the centre of the cake. Arrange some of the nuts in a circle over the top of the cake, about 5cm from the edge. Pile the nuts, figs cherries and remaining physalis onto the centre of the cake to form a conical shape around the skewer. Use the icing left in the bowl to secure the fruit and nuts in position. If the icing has been used up, make a paste with icing sugar and water. Secure the remaining marzipan stars around the fruit and nuts along with the cinnamon sticks. Dust the cake with icing sugar to finish. Store in a cool place. To prepare a 23cm round cake tin, line the base and sides with a double thickness of baking parchment, cut so it comes 5cm above the edge of the tin. Fold a double band of brown paper around the outside of the tin and secure with kitchen string. Stand the tin on several sheets of newspaper or brown paper. Wrapping the outside of the cake tin with brown paper helps to keep the cake moist, as it stops the edges drying out before the centre is cooked. Likewise, covering the top with a piece of folded parchment paper will stop the top becoming too brown before the centre is cooked. If a dome forms on the cake during cooking, slice off the top, just before marzipaning and decorating, to make a flat surface. To feed the cake every 2-3 weeks, prick the surface with a fine skewer and spoon over 2 tbsp Waitrose Brandy. Do not overfeed or it will become soggy and pudding-like. The alcohol that the fruit is soaked in evaporates during cooking. If you would prefer not to use any alcohol, soak the fruit overnight in an extra 100ml freshly squeezed orange juice instead of brandy. This dish contains semi-cooked egg and therefore is not suitable for the young, pregnant women, elderly people, or those whose immune system is weak. Candlelit cake: cover the cake with marzipan, then 750g white Regal Ice using the same method as for the marzipan. Arrange a circle of white night lights on top. Dust sprigs of rosemary and bay leaves with icing sugar and tuck around the night lights. Take care when using candles, they should never be left unattended or placed where they can be knocked over. 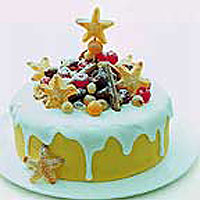 Fruit and nut cake: cover the cake with marzipan. Melt 4 tbsp apricot jam with 1 tbsp brandy and press through a sieve. Use to secure the contents of a 250g bag Waitrose Exotic Fruit and Nut Mix around the top edge of the cake, along with a handful of fresh cranberries. Drizzle any remaining glaze over the fruit and nuts. Tie a red ribbon around the side.